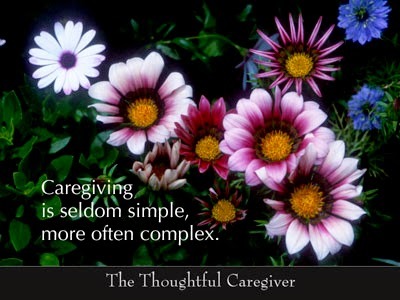 Caregiving is seldom simple, but it is the ordinary acts we perform each day that make the difference. I was a caregiver for Ed, my beloved Romanian life partner, for seven years when he had Alzheimer’s disease. Here are the ten most important lessons these people have taught me about themselves. Simple pleasures can bring great joy to a person with Alzheimer’s: Even the simplest activities can be enjoyable to people with Alzheimer’s. Ed was once deeply engrossed in examining a coat of mine that had numerous pockets. He spent 30 minutes with it. Another thing I learned is that – like all of us – people with Alzheimer’s usually enjoy receiving presents regardless of how big or how little. I gave one of my ladies a gift once. I told her it was just a small gift. She said, “I know honey, but it’s a present.” By that she meant that any present would be important. Pets, children, music and art may reach them on levels we cannot: I have experienced numerous examples of the positive effects these things can have on people with Alzheimer’s. There’s no question about it. Sometimes pets, children, music or art can bring about connections even with people who no longer talk and no longer recognize their loved ones. What it means (and what to do) when they keep repeating the same story or asking the same question over and over: Ed and my ladies sometimes kept telling me the same story or asking me the same question over and over. They didn’t remember that they had just told the story or asked the question. What I learned from this is that the subjects of this repetition must be very important to them. It’s best to respond each time as though it were the first time you’ve heard the information. Just because they don’t talk doesn’t mean they aren’t perfectly aware of what’s going on around them and what people are saying to and about them: One of my ladies didn’t talk anymore so when I visited I just held her hand and talked to her softly. I assumed she wasn’t aware of me or her surroundings. But when I told her she must be very proud of her daughter she adamantly shook her head from side to side, indicating ‘no.’ That told me she understood perfectly well what I was saying. There’s usually no reason to tell them someone is dead: It isn’t uncommon for people with Alzheimer’s to ask where a certain person is when, in fact, that person passed away years before. Rather than tell them the person is dead – which will probably upset them – it’s best to tell a little white lie and give some explanation as to where the person is and that they will come back soon. Showing them the death certificate, as some people do, will not help because they will soon forgot about it. Correcting them about something will probably either embarrass them or else start a big argument: Alzheimer’s caregiving and pride don’t mix! To avoid embarrassing the person or, even worse, to avoid a major argument, try agreeing with whatever they say, even if it’s wrong. It takes some time to master this approach, but it is usually successful. People with Alzheimer’s usually adjust to change more quickly than we do and they soon forget unpleasant things that happen to them. We may be the ones who continue suffering: I experienced some notable examples of this from Ed. Once he told me that he had been beaten by six aids at the facility where he lived. He was terribly upset – as upset as he would have been had the story been true. I suffered deeply knowing there was nothing I could do to relieve his distress. But by the next day he had forgotten all about it, while I continued to be upset for days. They can still enjoy life: Many people assume that people with Alzheimer’s can’t enjoy life. However, several experts I interviewed unanimously agreed that although Alzheimer’s is a terrible disease, people who have it can and do still have the capacity to enjoy life, even if it’s only for brief periods at a time. 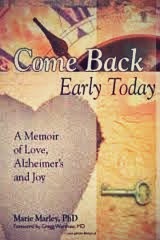 People with Alzheimer’s may remember past love and also experience love in the present: I learned this from Ed. Once I showed him an old picture of us together. He said, “Ah . . . She loved me.” Then he looked in my eyes the way he had when we were lovers more than 25 years before. He didn’t realize I was the woman in the picture but he remembered that she had loved him. And that’s what mattered. People with Alzheimer’s can be humorous at times: Many people with Alzheimer’s can be humorous at times. Sometimes they are even aware and proud that they’ve said something funny. Then we laugh with them not at them.